Public school systems in the United States face an ongoing shortage of highly qualified teachers, largely due to high turnover in the field. In educational reporting, turnover may refer to teachers that leave the state public school system entirely (referred to as “attrition”) as well as those who transfer to another location within the state (referred to as “mobility”). A 2017 report from the Learning Policy Institute found that as much as 90% of open teaching positions were created by attrition of existing teachers. While retirements play a role in departures, many educators are leaving in pursuit of a new career or higher pay in other states. In North Carolina, the state turnover rate was 13.4% overall in 2015-16, according to data from the North Carolina Department of Public Instruction: an average of 4.4% of teachers transferred to another district within the state and an additional 9% left entirely. The following 2016-17 school year saw mild improvements in attrition (8.7%). However, turnover remained the same overall (13.5%) and mobility slightly worsened (4.8%). Among teachers in North Carolina, retirement with full benefits was the single most common reason for leaving the profession for the last two years (18.7% in 2016-17 and 19.8% in 2015-16). However, resignation due to a career change and leaving to teach in another state also ranked among the top five reasons for attrition in both years, behind family relocation. 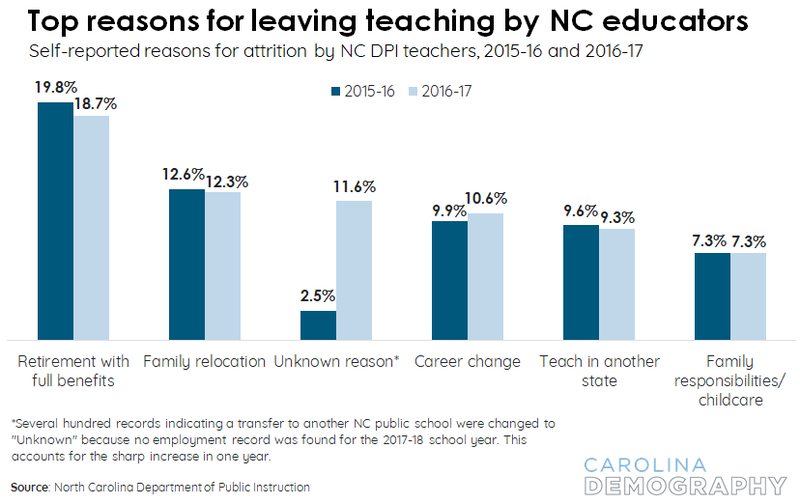 Individuals who reported leaving North Carolina to teach in another state declined as a share of total departures (from 9.6% to 9.3%). Meanwhile, a growing share of North Carolina teacher departures reported leaving for a career change (from 9.9% to 10.6%). The number of teachers seeking work in a new field grew by 2% from 2015-16 to 2016-17, even as total resignations dropped 4%. This supports findings at the national level that teachers have been steadily leaving their jobs for others careers for the last three years. Where are NC teachers going? 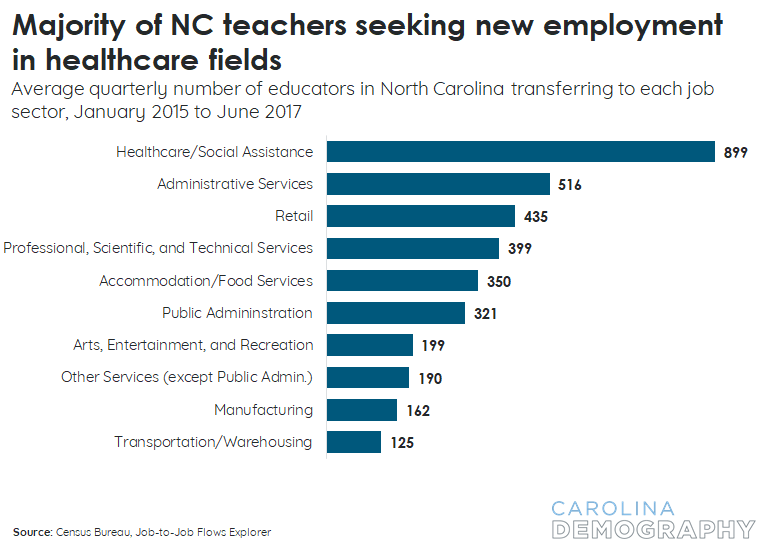 In North Carolina, the majority of teachers leaving educational services are pursuing careers in the healthcare and social assistance sector, according to job flows data from the Census Bureau. This data, which tracks both attrition and mobility, found that the number of teachers leaving each fiscal quarter to pursue a new career greatly outnumbered those who transferred to a new school system. Approximately 4,100 teachers left for a new occupation each quarter. The graph below represents the top ten occupational groups sought by departing teachers. These job-to-job flows suggest that teachers may be seeking new career paths that utilize similar skill sets to teaching. Healthcare may specifically attract individuals with strong interpersonal skills, a desire for a people-oriented career, and a high degree of flexibility and empathy. At the same time, healthcare jobs generally offer better pay and hours than teaching. Similarly, North Carolina teachers were least likely to transition into job sectors with no clear link to prior skills, such as agriculture, utilities, and mining and gas extraction. While some turnover is expected and can be beneficial to any industry, high turnover in education can negatively affect student performance in reading and math. Even when the quality of the replacement teacher was found to be higher than their predecessor, researchers still found a disruptive effect in student achievement. In North Carolina and the nation at large, teachers are increasingly leaving the field of education in pursuit of other work. To learn more about teacher turnover and associated factors in North Carolina and other states, visit this interactive from the Learning Policy Institute.